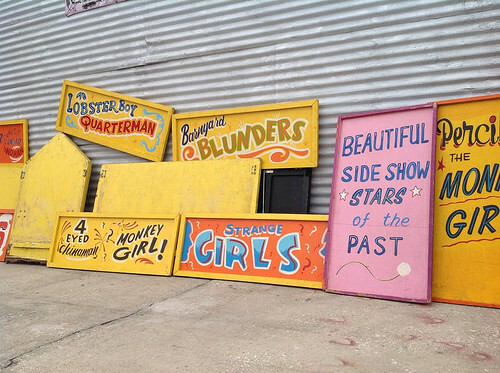 Florida-based show painter Jim Hand is (forgive the pun) an old hand at painting signs and banners for circuses and sideshows including Hall & Christ’s World of Wonders. Over the weekend he posted these photos on his Facebook page with the following pitch that quickly gathered a tip of interested customers. I have been saving (hoarding ?) this stuff thinking I might need that piece ‘some day’…. PM me if you have any interest…. Autumn Reading: Ward Hall – King of the Sideshow! 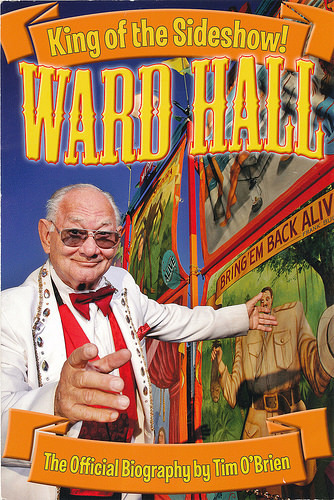 The official biography Ward Hall – King of the Sideshow! was published with great fanfare earlier this year in celebration of Hall’s 70th anniversary in show business. More than a dozen years ago, while traveling with S & S Amusements as the High Striker Girl, ATZ had the honor of being on the same midway as Hall & Christ’s legendary World of Wonders. At the Great Allentown Fair, where the patrons love shows, the throng in front of the banner line and the torchlit bally stage conjured up the long ago golden age of the midway. Hearing Ward deliver his classic pitches against this backdrop was one of the unforgettable moments of the season. In 1946, Ward Hall left his Colorado home at age 15 to join Dailey Bros. Circus after answering an ad in Billboard for a magician and fire eater. Though the teen did not yet know how to eat fire, a friendly canvasman taught him the skill and before long he was also working as an outside talker on the sideshow’s bally stage. 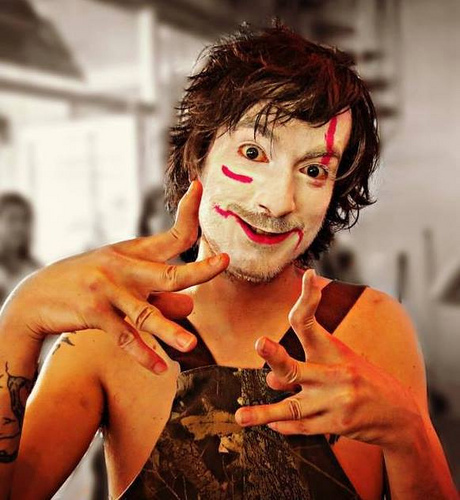 “I didn’t know what to say, so I looked over at Norma, who was selling tickets, and she hollered at me, ‘Tell ’em about the painted-face mandrill.’ Well, I did that and then I looked back at Norma and then she would tell me what to say next,” Ward recalls. By the 1960s, burlesque dancer Sally Rand had crowned Hall “The Silver Throated King of the Carnival Talkers” in an NBC documentary Carny. 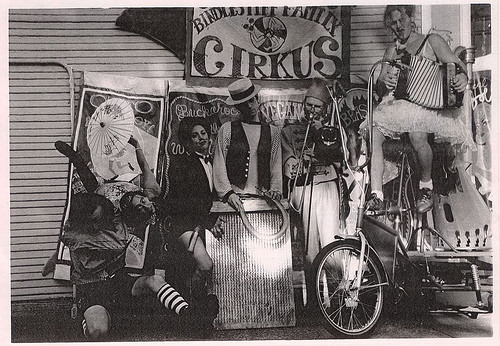 Sideshow historian James Taylor gave Hall the title “The King of the Sideshow” in the 1995 volume of Shocked and Amazed–On & Off the Midway. Author Tim O’Brien, who first wrote about Ward as a reporter for Amusement Business, has masterfully researched and organized material spanning the showman’s career in sideshows, circuses, theater, movies and television, and his partnerships with Harry Leonard and Chris Christ. Photos, clippings and anecdotes from their life on the road are interspersed with chapters about the art of the bally, the value of the banner line, carny lingo, and Gibsonton, the Florida town fondly known as “Showtown USA,” which Hall and Christ call home. Among the subjects covered in the book are why there are so few sideshows and freak shows today compared to 30 years ago. Hall says it has to do with economics, not political correctness–spectacular rides have replaced shows on carnival and fair midways. Also of interest are details of legal cases which were fought and won by Ward, such as a three-year court battle that successfully overturned the 1921 Florida law banning the exhibition of human oddities. 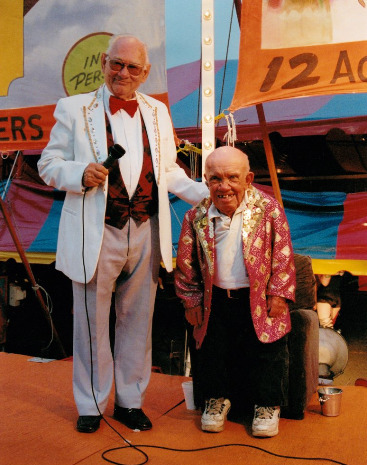 The plaintiffs included Pete “Poobah” Terhune, a dwarf who worked with Ward and his partners for 55 years as a fire-eater, snake handler, circus clown and king of the pygmies. In the 1971 ruling, the Florida Supreme Court ruled the law unconstitutional because the plaintiffs “must be allowed to earn a livelihood.” The chapter “Ward Meets Pete: How a Dwarf Won the Heart of a King” is a loving tribute to Pete, who passed away at age 82 in 2012. Double, double, toil and trouble. Fire burn and cauldron bubble. 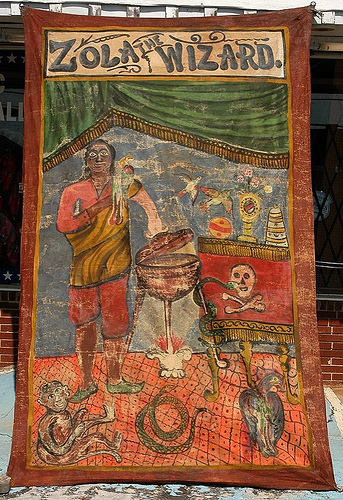 This early 20th century sideshow banner advertising “Zola the Wizard” will be on the auction block this weekend at Slotin Folk Art Auction. Phone and online bidding is available for the sale in Buford, Georgia. The pre-sale estimate is $1,000-$2,000 for the piece, which measures over 10 feet high by 6-1/2 feet wide. Black history month is over and guess what? There are people who still don’t know blackface is never okay. Last year, it was Brooklyn State Assemblyman Dov Hikind, who wore an afro wig and brown makeup to a Purim party, and whose apologies showed his ignorance. 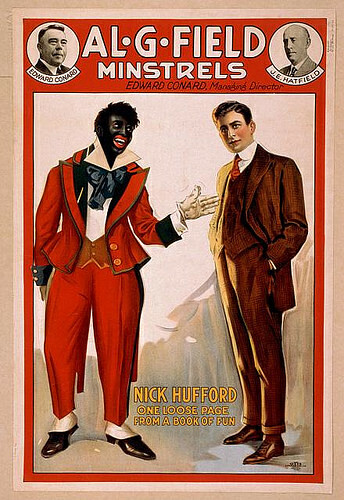 Now New York’s sideshow and burlesque community is in a furor over the news that rubber skin man Rush Aaron Hicks did his act in blackface at the Lower East Side’s Palace of Variety, the Slipper Room, on Friday. Initially, the performer tried to brush off criticism by posting that he did it “at random” and wasn’t racist because he “slept with two black girls this year,” which only made matters worse and provoked a rebuke on the blog Jezebel. Since then, all posts on his Facebook page that are critical of him, including outraged comments as well as friendly advice from members of New York’s sideshow and burlesque world, are being deleted. The Slipper Room has always been a place that has welcomed diversity. Over the years our stage has been graced by people of every ethnicity, sexual orientation, body type, and proclivity. We do not now, nor will we ever have, a policy of telling artists what they can and can’t do in their acts. Rush Hicks made a poor choice in doing blackface. His unfortunate comments after the fact have only served to make matters worse for him. We had a few bookings with him for this spring, which we have cancelled, to give him time to reflect on his actions and their consequences. Yes I am aware of this sad controversy. Rush is not currently under contract with CIUSA. His questionable performance took place at the Slipper Room and he was in no way there on behalf of CIUSA . He was scheduled to perform with us in a few weeks and that appearance has been cancelled. Congratulations Rush Aaron Hicks. 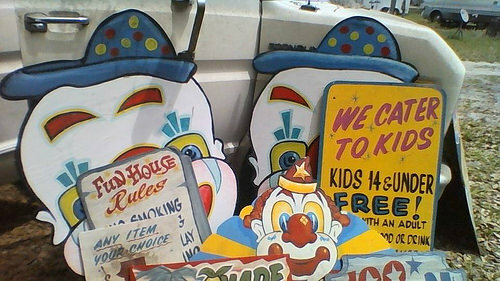 You are doing exactly what any good clown should. Playing the fool to expose the foolishness of others. Plus you got LOADS of FREE advertising for yourself, The Slipper Room and every other venue and performer/producer who works with you. Including me! Thanks for saving me the expense of a full page layout in the Voice for our shows. I’m one of the few producers who understand that in showbiz Controversy like this is simply… GOLD! 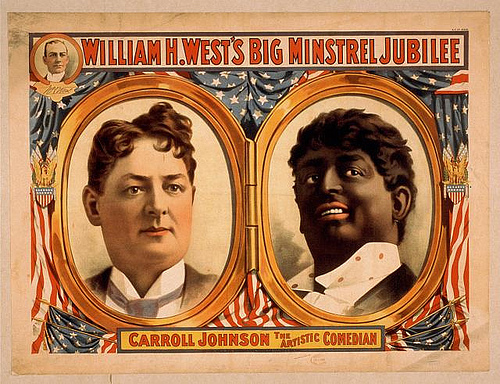 The vintage posters shown above are from the Library of Congress’s collection of more than 175 original lithographs documenting the history of 19th and early 20th century minstrel shows.